What if like in late Germany the Heldann Knight ordained that magic-users are a threat to the Faith of Vanya and the Heldann State. It might be triggered that the more powerful and thus mostly more solitude mages and witches have great impact on the thoughts of freedom in the local populace (even when not aware they are mages) as they are mostly the highest of intelligence. Together with the Day(s) of Dread, The Wrath of the immortals events, The Ethengar Invasions, The Heldann Assault on the Ethengars/Broken Lands and helping the Western Defense League in the Great War and thereafter, this could well have ingnited a great dissentment against Hakomon, Witches, Mages, Seers and Sages, as they all might speak against the Heldann Knights and their rule or even speak of freedom or worse incenting revolt....or even speak of prophecies foretelling the downfall of the Heldann knights...or how to...something absolutely rejected/objected and assaulted by the Order. A 'good' counter idea of the Heldannic Order is to accuse the mages, witches alike of all things going wrong, and that they attempt to keep control over 'Their" nation, mate with demons and attempt to call in similar evil...at least that nonsense rumour would be spread with ease. As the link above speaks of 17.000 to 26.000 executions in germany in a period of 50 years (trier in as many as 1000 executions between 1581 and 1593=12 years=100 each year), and the Heldann Knights rule since 995AC?? ?....a similar number (1000) of Mystara -Heldann witch/mage/hakomon/shaman/wicca Exections might have taken place. (not counting the extermination attempts of all humanoids). I could not find anything disapproving this suggestion, actually indirectly (way of acting in and after the Great War by the Heldannic Order) only to support it. what's your idea on this?? Well it has to be considered the Heldanns allied with Glantri, a nation of wizards.. on the other hand, they do not seem to care much about Glantri outlawing clerics, so the alliance seem rather opportunistic. Or maybe the alliace established that Glantri would allow clerics of Vanya and the Heldanns would allow in their lands Glantrian wizards..
12-01-2019; Finished the tedious labour of creating the Sea of Flower Cliffs. 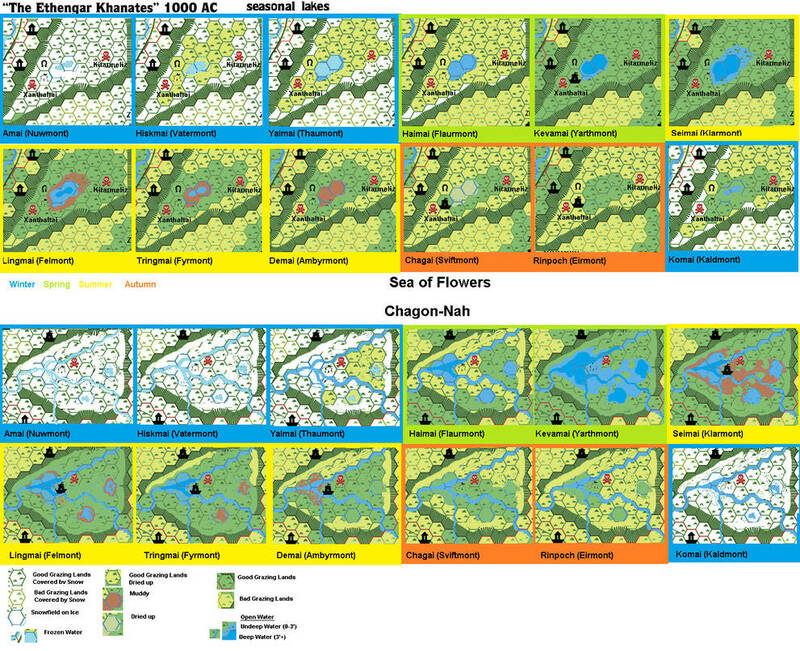 Now it can be clearly seen there are many ways to enter the Sea of Flowers; easy grassy ones (hills or flat) allowing normal speed down and 2/3rd up, or broken land ones with a speed reduced to 1/2 going down, and to 1/4 going up, with the additional risk of harming the legs of your mount at 10% ever mile (half if known the area), not counting the vermin/humanoids/monsters which might roam nearby in caves or on these cliffs. The western side of these cliffs has a secion called; Böögiin suudal (Seat of the Shaman) here Shaman reside in the caves for contemplation, meditation and even Atonement. 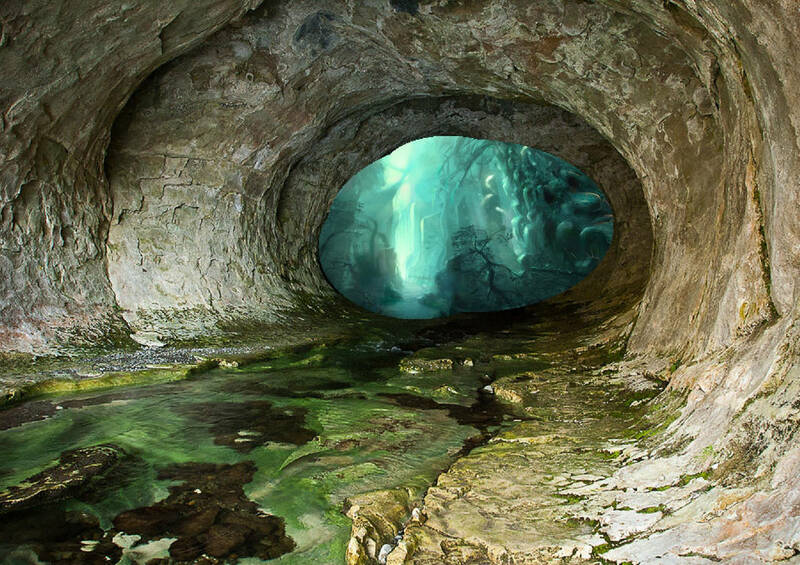 They use the undeep caves(no more than 30' deep and not connecting) they created in ages past to view the Hakomon location in the Sea of Flowers and the magical lights it spreads. These they attempt to read to ascern to will of the Immortals and omens of the future. Even the name of the canyon seems to bring life. nice. The pictures make it even much more interesting, hence I did the same with the map. The canyon is an effect of the elevation of the Rise of the Ethengar Plateaux and the breaking of the Heldann section while rising. Not only created this effects cliffs in the hills but also a wide canyon (100 to 800 yard wide with the north side an average 20 to 60 feet in height and the southern side an average 70 to 120 feet in height, making it possible to look down on the northern side and unable to do the same reversed. I also fixed the Overlap issues with the Ethengar NW map and the Ethengar South Map. Ok. I knew the temporary alliance in the Great War... basically due the Black Plague roaming in Glantri. It however originated in the Heldann Freeholds, so it might be Vanya send clerics and a political agenda to prevent seer from becoming right and the Blame is put on Heldann. The agreement not killing but accepting Clerics (with legally restricted and registered powers and still a prohibition to spread the faith), might indeed have a similar value in Heldann where Glantrian mages (only) are no longer put to gallows, guillotine, firestack, impalement pole, or local river with bound arms and hands as long as they are identifiable as being such (probably by wearing a large adderstone=large stone with natural hole within) around their neck all the time and like in Glantri allowed only casting under guidance of a Cleric of Vanya (who in Heldann thus carries the Spellbook of the mage and has read /studied it in detail). So enough for today; Tonight I am dancing till the sun rises(or a little beyond )...and tomorrow I will be a zombie. 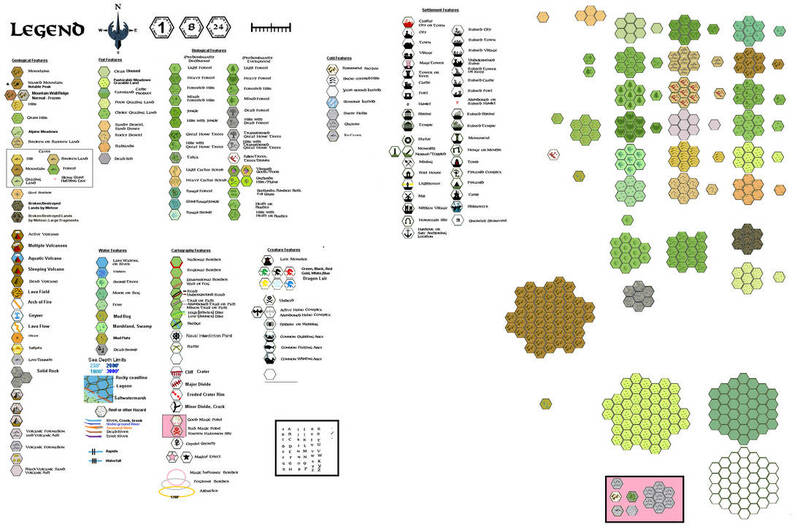 Ok again to the weird Chagon Nah detail map on the back of the Ethengar Hex map. spring large lakes form here, and as spring gives way to summer, the lakes begin to dry up, leaving many small lands surrounded by small lakes and ponds. 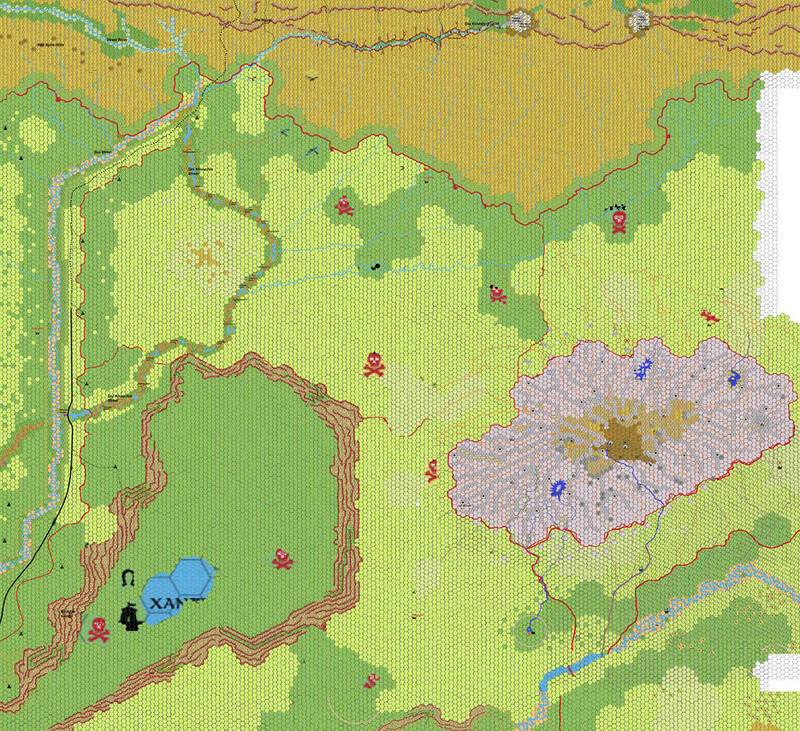 To enable the Krandai AND the Hrap flowing through this tienymieny section of the map while the large lake absorbes the Hrap on the 8 mile hex map much earlier is foolish to continue to keep, especially as it plows through higher grassland on the courtmap. Secondly the description in the Gazetteer 12 (Golden Khan of Ethengar) says "small islands surrounded by small lakes and ponds are formed in the summer". This means the spring water dries up, leaving behind ponds and lakes which are connected to eacxhother creating small islands. To make the court map as fitting as possible cannically it is best to assume within these lakes are the small islands used in the Court map and an arm of the Kranday River flows through the large lake where the islands are displayed as being the courtmap. As such the Hrap can be fully disregarded being only a small wet area between the Southwest Island and the Southeast island. 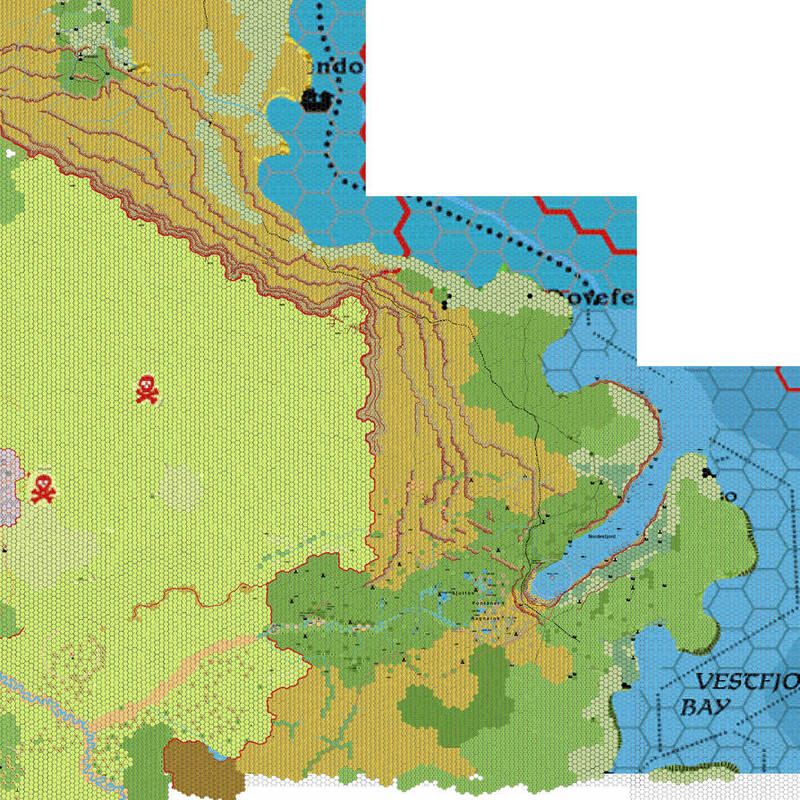 And the corner of the Krandai entering the map can best be seen as wetlands (where the earthen pass is now a board on poles path similar to the bridges), and the northern section of the map is then the main Lake. The designers of the Hes and detail maps clearly did not work together, and still it is also weird to see the designers of the 8 mile hex map named the only one of the smaller lakes (Lake Balbak)and not the main lake nor the other...ok The large lake might be assumed the Chagon-Nah description is not only the name of the Depression in which the lakes happen to bee, and the head of the summer location of the Court of the Goldfen Khan, but also as the name of the Main Lake, yet this feels weird, as too much locations are named equal...as such I deem it best the Laker is called ;Nuur Chagon (which is Mongolian(as such best Ethengar) for Chagon Lake. The second smaller lake I decided to name after the nearby battle; 'Nuur Kiyatida"
Here the Quotes from the Gaz 10 Golden Khan of Ethengar I used to determine the seasonal effects on this series of maps (hexes are here 8 mile). The high altitude of the steppes subjects them to extremes of temperature. In the sun withers the grass and the winds whip stinging dust into the air. In winter, snow and ice are common companions and fierce, icy winds howl across the land. For the four months of winter, the steppes are swept by cold, byting winds that blow of the Colossuss Mounts in Glantri, threatening to throw riders from their mounts and send Yurts tumbling across the icy wastes. In spring, the ice melts and flowers and new shoots poke through the ground. It is with the Spring Thaw that the ethengars resume their nomadic wandering after settling in one Place to wait out the deprivations of winter. Summer brings four months of an intense sweltering heat that withers the grasses and causes the rivers and ponds to grow shallow. It is during summer that the Ethengars are forced to travel almost constantly in search of grazing lands to keep their herds fed. summertime temperatures rarely fall below 70degrees F, except during the night when clear skies, altitude, and biting winds combine to cause the temperature to plummet. Here the steppes enter a sheltered depression from the worst ravages of the winds. The Sea of Flowers is is the most fertile part of the steppes as this area is well irrigated by water flowing from the higher land surrounding it. In spring, this reggion is covered with the many colorful flowers that give it its name. Lake Talkai forms in the Spring Months from Water flowing into the Sea of Flowers and attracts large numbers of birds and game. In summer the grasses, although protected from the scorching winds, are subjected to high temperatures that turn the Sea of Flowers into a land of Yellow Grass. Lake Talkai dries up and fine grasses grow on its damp bed. In Spring and Autumn, the Court of the Golden Kahn van be seen stretching across the southern part of the Sea of Flowers. In winter the Court is in Bargha. Krandai river, the land is wet and waterlogged, with large expanses of water lying between the confluence of the three(not two) rivers. In spring large lakes (and waterlogged wetlands) form here from the meltwaters cascading down from the Makkres Mountains. As spring gives way to summer, the lakes begin to dry up, leaving many small lands surrounded by small lakes and ponds. Great Numbers of Trees and Bushes grow here in the fertile soil, making it and the surrounding plains a popular place for birds and other animals to gather. The normal wetness of the climate helps to keep Chagon-Nah cool and full of wildlife of all descriptions. construct bridges over the lakes and ponds to connect the islands of the court together. ...Shallow, Broad, and Slow flowing ...follow the downward tilt of the land to join the Streel River before turning south into the Broken Lands. Summer travel; Shallow-bottom barges propelled by sails ar by paddles at the stern of the barge. 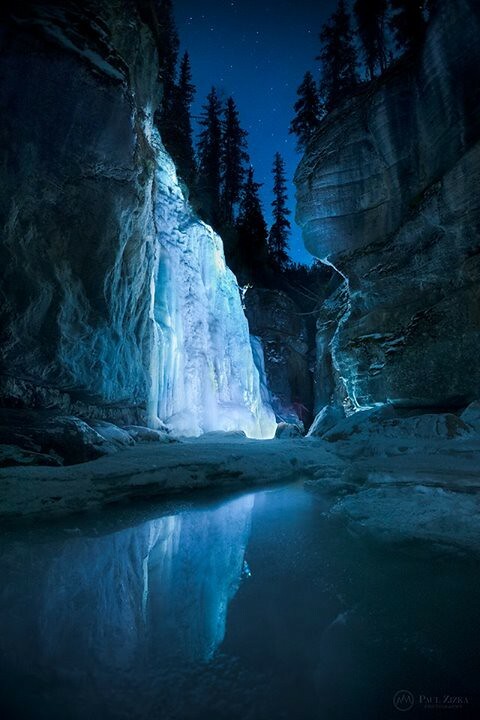 In winter the rivers freeze over , transforming them into natural highways for the Ethengars. Do not expects flat ice planes....as a frozen river is breaking and refreezing continuously until it is an irregular top layer over the still flowing water underneath. any travel over it must be done with care, until a vast layer of snow covers it. All this combined into the 8 mile hex we get the following 12 monthly maps for each of these two regions. Last edited by Robin on Thu Jan 17, 2019 7:16 pm, edited 1 time in total. Now I can continue to implement third grade information from these maps to determine more detail to the 1 mile hex maps of these region. These are the only areas thus far on the canon maps which have major changes through the seasons; flooding, islands, drought, rivers...all encompassed in one area which alters the the area constantly. Never expected that a region so boring full of an almost single source (grass) could be thus diverse. Although it has a heck of research and work to implement all the canon, then all the fanon(mostly this is the historic temporal information), and the bio-, eco-, geo-logical information into these maps. I like to make these maps, as they continously seem to trigger my brains in working to a real as possible end result. I never expected that even here the end result seems fluid and more real. I know I am a bit chaotic...jumping from one of the maps to the research to another map section of Ethengar, ...yet hey...understand this area is giganormous...(even the 1hex Alfheim and Broken Lands maps had it problems on making/saving/storing and revealing and had to be split in two to enable visibility t all of you)...so I had to split this huge map into 6 sections (where I created the World Mountain map extra with pictures to help DM's envisioning it). I think I need a new overview of all these maps I made/am making to help in collecting/clarifying for you all. So this will come up soon. Last edited by Robin on Tue Feb 26, 2019 6:21 pm, edited 1 time in total. I feel some more 3050BC minor ruins should exist, yet no larger than a village. 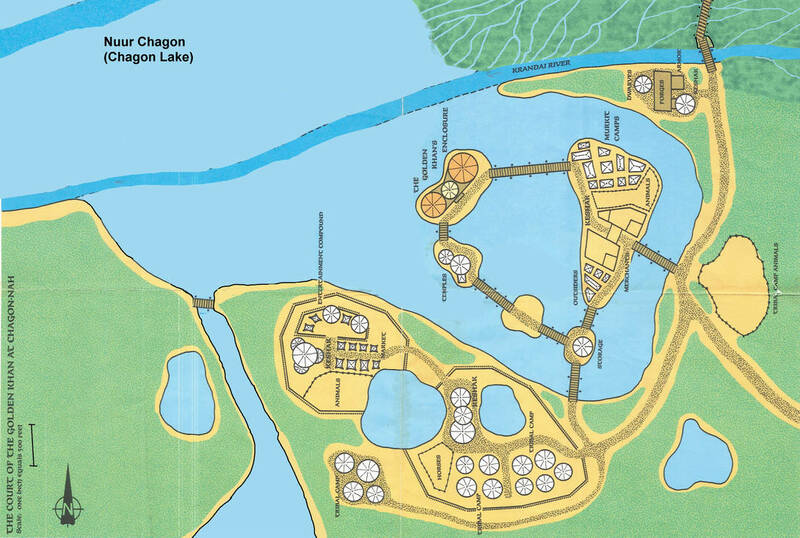 Several sources(mostly fanon, but some hints are made canon) spoke of mages after the 1700BC disaster and before the rule of Moglai Khan, which could have either been spies, adventurers, or researchers...eitherway the eventually all left or perished...however, some towers might still exist. The orange creeks/rivers are seasonal, the Dark Blue are permanent, however are toxic (minerals, saline, chemicals or even magical or organic) most of these eventually dry out, or are absorbed into the underground, However, seasonal influences might allow this water reaching the main Krandai River increasing its yield of minerals, the amount of water in the river prevents it from becoming toxic, except where this water enters the river(here the toxicity is mild, and causes severe stomach cramps for 8+1d8 hours unles treated with special herbs, remove poison or similatr which halves the duration (the poison then is gone, the body must heal then naturally). Ok with the Ethengar North map World Mountain map had to be updated too. I created a photomanipulation from the eterniaroleplay wiki and a cave entrance into the portal to the Spirit Realm on top of World Mountain in Ethengar. Here the Hakomon enter the Spirit Realm to bury the dead Khans within as per canon gazetteer 10 Golden Khan of Ethengar. Together with the map it gives a realistic image of World Mountain. 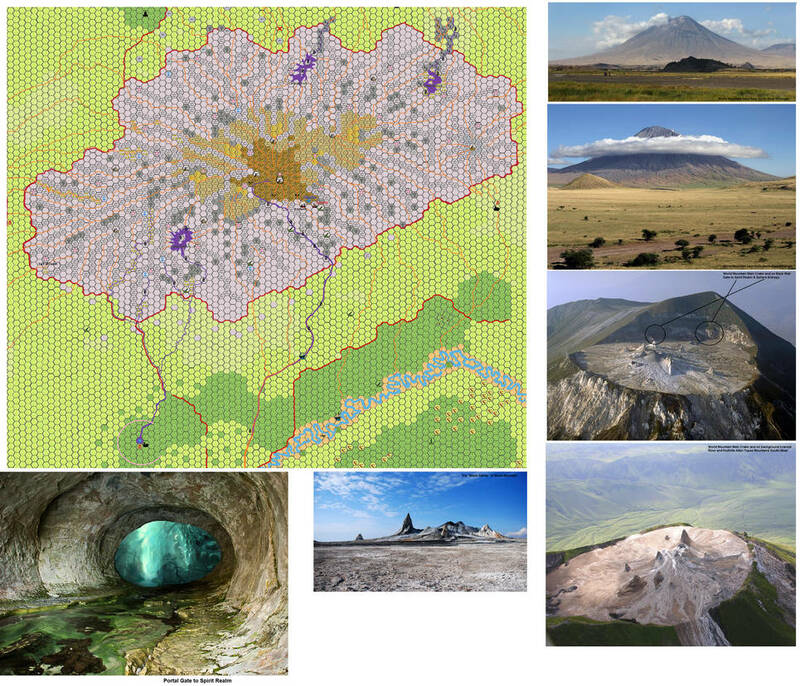 The other pictures on the map are of the Real Life volcano elDonjo Lenghai on which World mountain was based originally, and enhanced this idea by me. Please keep in mind the map is still a work in progress and will surely suffer some minor changes later. 20-01-2019 Started with a minior overlap from the Ethengar North map, then scaling the 8 mile hexes so that 8 hexes fit in all 3 axis, then Major hexing, using the hex mastermold (this really helps) and the Legend work hexes, this way is is tedious, but rewarding work to place the general hex information. 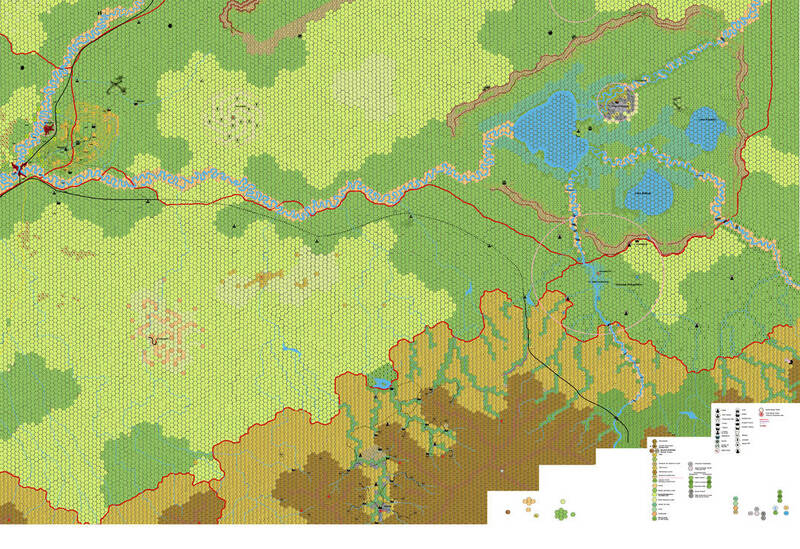 Also worked on the geological elevations in Heldann and Vestland to allow a 4000! !+ feet plateaux to be near (only 10 9 to 10 miles) the ocean...cripes...only possible with cliffs and droppings...or mountains...and these last are NOT there as per canon. the cliffs could be a hilldetail as given per canon. Always trying to stay as canon as possible while adding realism and other fan stuff. At least Now the base is laid out when Chimpman comes with the 1000AC information I need on the sections he created for the 2300BC setting. A lot...heck a lot detail will follow the upcoming weeks/months until it is ready as well as the other maps. So keep your eyes open on the development. Sometimes I think my mind plays even more evil tricks with me. I had a nighmare where I was wandering in a forest, when suddenly there were only large colored blocks and tiles, with weird blocky (8bit?? ;) )plants and creatures in front of me. I did not dare to thread further until I then suddenly saw a huge hex shaped platform coming down, and all was becoming a real forest..
As if i was already wandering in the region before it was finished..awkward.. Yet is is typical, I get ideas by mentally walking through the regions I create. In Alfheim I know regions where specific plants grow, in the Broken Lands I wandered in kolland, unnokticed by the many humanoids there. And now in Ethengar I looked up on the cliffs towards the watchtowers of Glantri. As if I am literally creating a world...weird but also awesome. Not to bed I go, coming days Real Life bothers me again. "Khanistan: The ruler is Khanistar, a 17-HD blue dragon. Her lair is located on the World Mountain, at the centre of the Land of the Black Sand in eastern Ethengar. Khanistan stretches 80 mikes from there in all directions. Khanistar's lair lies deep inside a tall mountain that is dotted with sinister towers. The towers, built by magic over the centuries, are covered with stone barbs and talons. Minor dragons and other lesser minions occupy these towers, remaining constantly on the watch. Khanistar is a long, coiling, serpent-like wurm, Oriental in style, with large globular eyes and light blue scales. She has no wings but is skilful enough a spell-caster to overcome that limitation. She spent most of her 180 years of life seeking magic. She built an impressive library of rare and ancient spells, including a few abominations dating from Nithia. Khanistar relies heavily on magic manipulation for reaching her goals. Khanistar is famous among dragons for using pocket dragons as spies or messengers. These are specially bred strains with blue scales, She mated once and so far has remained neutral with other dragons. Her weakness lies in her excessive attraction to magic. She may agree to suspicious deals just to acquire an old spell or lost artifact that she's been seeking for so long." 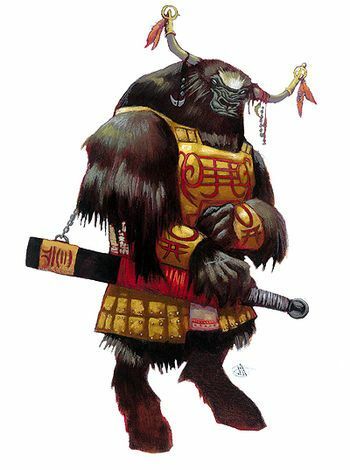 Also in the Dragonlord Chronicles, Yak spirits appear in the World Mountain in the form of Yak Men. I'd like to have Yak Men living in the region, maybe a local variation of minotaurs. They could be minions of Khanistar or not. Khanistar may have lizard men or troglodytes minions which live underground, from the time the steppes were wetter and swampy and they dominated the surface. Also some local centaur tribes could be servants of Khanistar. Sliktor Orcs too are likely to be controlled by Khanistar. The Lair of Khanistan is between Kairhyeld by Chimpman's 2300BC setting and your Grassdale 3050BC creation. It is set as a Blue dragon hex symbol on the map already.. I read Bruce's description of Khanistar's Lair, and envisioned this picture to be the best as to the location. 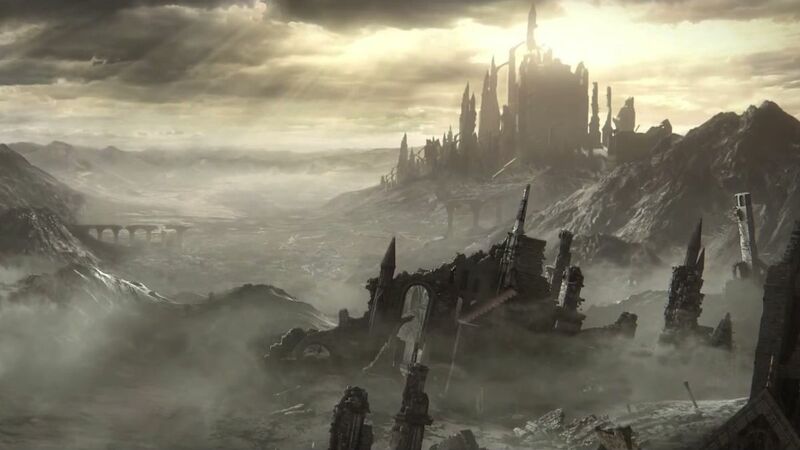 As it holds the ruins of Grassdale in front, and Kanistan's lair in the back, build by magic from and on the ruins, the dark area shrouded in the volcanic ash of World Mountain. Here a picture I see as best being Kanistan. her eyes flsaming by the magic, her skin, due the volcanic ash and the shrouded darkness, or her contact/manipulation with Entropic/Blackmoor magic, turned into a dark-grey color. She is a master illusionist (like the Glantrian craft 5th circle( with all abilities, further enhancing the confusing environment. She surely would have control over the Sliktor orcs, who live in the volcanic tunnels in the north, and her powers would surely have her control the wandering undead to at least a basic 'leave-me-alone-don't-disturb'agreement. She would surely have control over evil spirits, and maybe even several good ones. I do agree the area was much lower, and diffrent, and could indeed have had a more wetter swampy climate, yet the current differences over 4050 years or more (I can't find canon/fanon sources describing the area other than a cold grassland, with some forest before 1700BC), so these reptilans indeed must have went much deeper, to the warm/hot and humid volcanic caves below. However, the cold climate upstairs would diminish her use of these creatures on the dark ashy shrouded surface (as being cold-blooded reptilians) yet she might use these to delve for minerals or funghi growing below for components in her magic research. The Yakmen you mentioned earlier, and I like the idea. Your earlier assumption of them being Fairies and now Minotaurs give me an idea; What if the spirits or fairies, now with an continuous open gate into their realm and an entropic gate next to it, enabled the Minotaurs living on the dormant volcano before the 1700BC disaster to survive, by altering them, giving them some spirit powers/magic and adapting their shape slightly to becoming the guardians of the gate to the Spirit Realm. The have some temple-like locations on World Mountain to defend against the outside Entropic Influences and incursions, yet within they have a vast fortress to defend against entropic intrusions. As such they would be the first to encounter if entering the Spirit Realm , making the description in the Dragonlord Chrnicles logical. My earlier idea of the Spirit/Fairy Realm enveloping the moebius shaped Limbo, withan Spike of the Entropic Realm inbetween, breaching the Prime Plane on this location, would make such a defence needed. 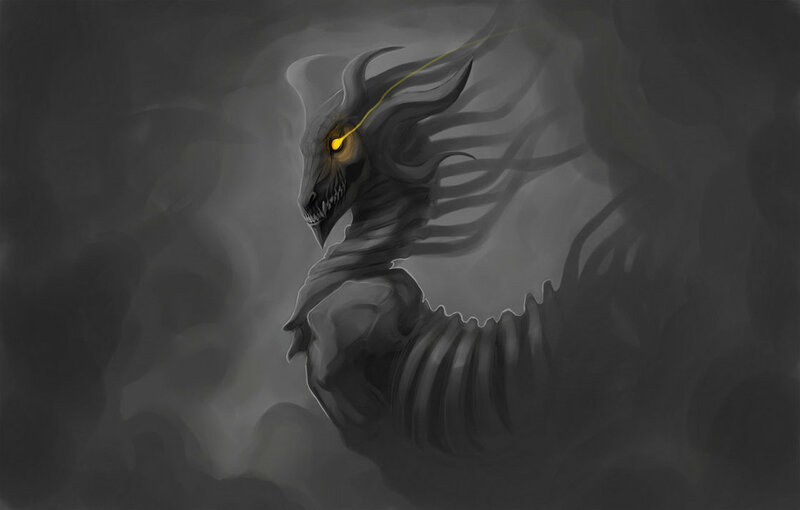 The Entropic influences want to control Limbo, for this would give them a limitless source of souls, which otherwise wouuld reincarnate, or turn to Ethernal Rest in the Realm of their Immortal(s), or even become Angelic. Probably they have had some incursions earlier (I suspect the Nithian era as this period was the greatest in undead powers/creations) thus having many undead or Nightwalkers/-stalkers/-wings/-other, and Masters and Minions of Chaos within. There is almost no note of Undead in the Blackmoor era, so I assume they did not exist that much, I think it was this first incursion enabling the Undead roaming Limbo, and the Prime in their current number. And this might have been the reason the Immortals wiped the Nithians away, doused the Undead might, and with the Yakmen closed the entry in to the Spirit Realm and hence Limbo. To come back to the Yakmen, They are thus original Minotaurs, spirit/fairy adapted to their task and new environment. As such they could be new creatures...I ponder on this somewhat, to find their statistics/abilities and such. It would make an appearance of a Yakmen to Hakomon or regular Ethengars an encounter to remember in awe for eternity. Thanx. I had the same general feeling, due the dragonlord Chronicles background, yet now they (or at least several of them ) have more mystical powers to be used against intrusion into the Spirit/Fairy Realm. I now (the last 3 to 4 hours) did create these creatures and made it into a small PDF file. Hope you like their statistics, background and abilities. Contradictionary to the AD&D2 and newer D&D versions this Yakmen is NOT, I say NOT evil. Here the PDF about Mystara Yakmen as Guardians of the Gates to the Spirit and Fairy Realms. Great...and the good thing is, they can even be used as PC's, although I would prefer them to be NPC's in various levels. Ok I could not do much but I haven't been without work. 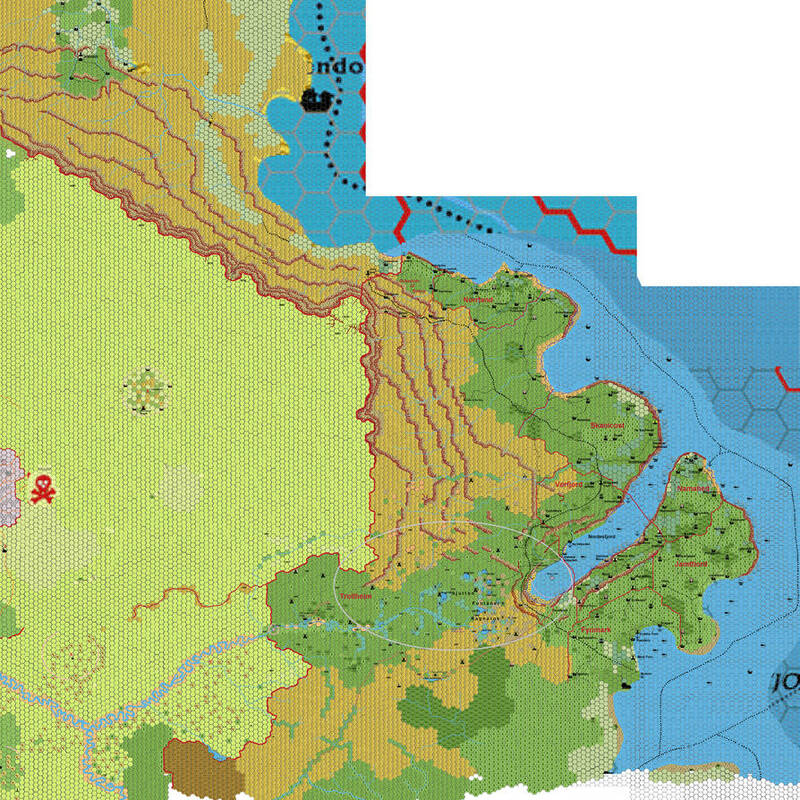 23-01-2019; Continued in adding details;Worked in more detail from the old Krandai river map. I added more detail in the water of the Nordesfjord (including a flood lines <=dark-blue>where it is needed--ie; flooding a large area). worked on the altitude cliffs in the hills of Vestland, Heldann, I already know the exact altitudes will be a devastation to my mind when I am thus far, so first the other work. I filled in the last of the empty hex fields, and envisioned the Flow Patters of water and human movement. As such I created the major and some minor Trails(which of course will lead to settlements, etc). I also Created and used a few nex hex symbols. 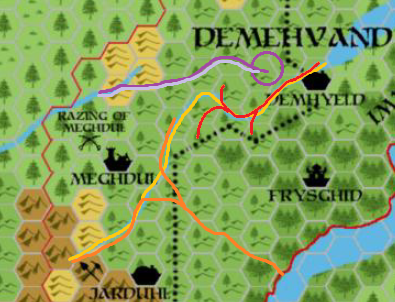 And I added the Dhemyeld River I questioned about, almost as it was in Chimpman 2300BC mapshere. This river will recieve some more attention soon. As before any comments, questions and additions are more than welcome. Small yet irritating flaw in the Yak PDF (shifted table) restored. I found several canon upon canon, and fanon upon fanon, and fanon upon canon contradictions on the Heldann region. My desire is to stay canon as possible, hence I want to implement all TM1 information. Yet my discovery led to several discrepancies. Also other canon maps (on which I thusfar focused) seem to have a very variant coastline and only hilly area in that region. 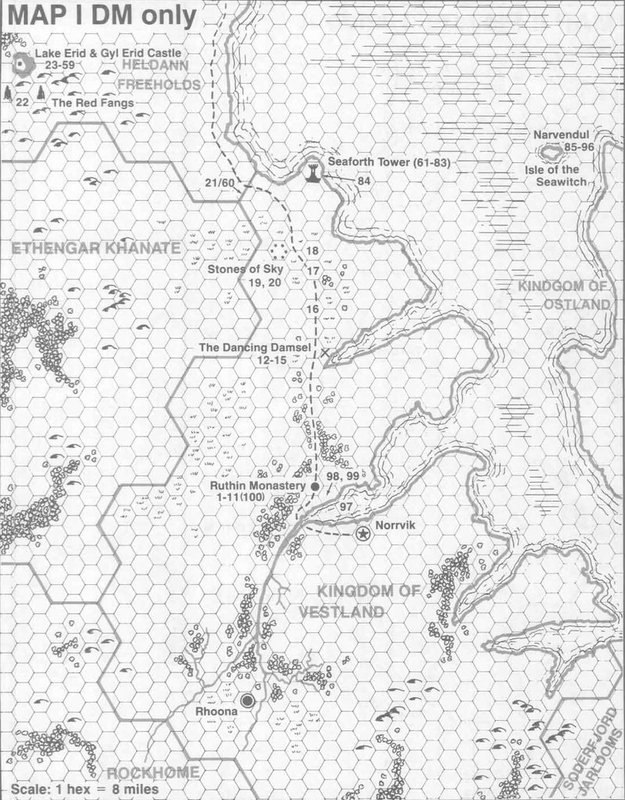 The map http://www.pandius.com/heldann.jpg by Geoff Gander at least takes TM1 8 mile hexes into account, yet it does not keep record with the information from TSR 9218 - X13 - Crown of Ancient Glory. The mountain spires are not visible, yet Lake Erid is(although it seems to be placed too far east). To Geoff I have this Question; The Sudbergen on your map, is this canon-sourced or your own input?. Because I do like the section, and especially when it is canon(although I would like to have the source then ) I would need to implement it, otherwise I intend to merge your map (in the sections I have) with that of JTR's map. Then the Spires from Crown of Ancient Glory would be a seperate section of the Sudbergen. Any input is welcome on this. I already send a PM to Thorff on this, but I also welcome any input by Geoff, and of course others. Busy on working on the above mentioned issues, hoping Thorf will help. And Geoff of course. Ok I have sent an PM to Thorf, and a line to Geoff requesting for help on the Heldann section. Hope they will react and are willing and able to help. So if either of you read this and have missed my messages to you...Please Help? 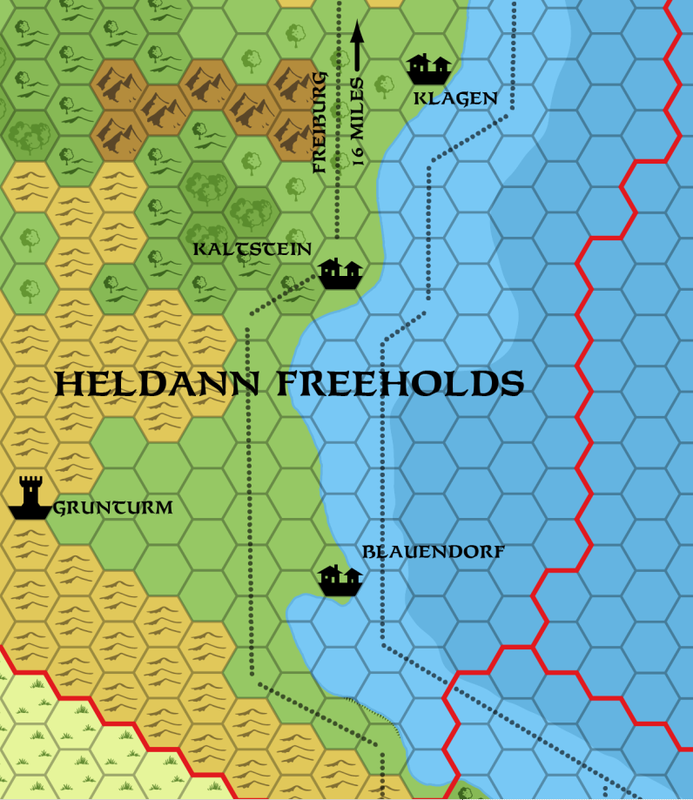 Eitherway, as I thus can't continue on the Heldann section of the map, nor on the Hakomon Locations I concentrate on the Vestland section. 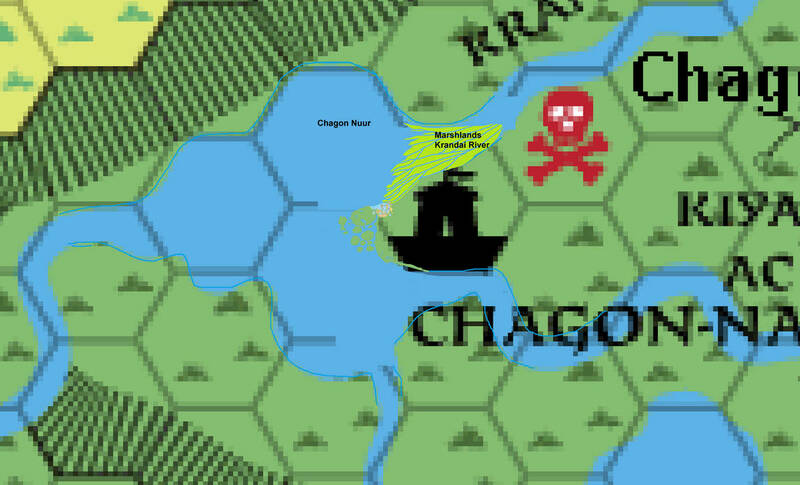 I have redrawn, improved and interred the old Krandai map it into this map. , and interred these in the map as such. 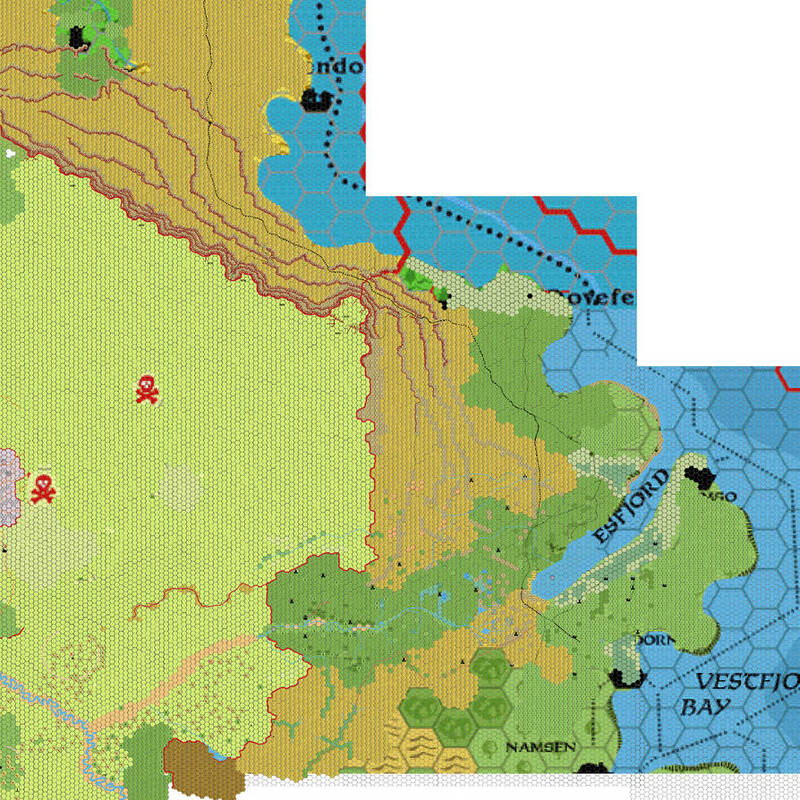 Gallma, Krenholme, Finhagen, Vander Plett, and Darnen are all due west of Norrvik, near the Ethengar Khanate border. Glenfork is at the southern tip of Vestland and Brinforth is the peninsula area northeast of Norrvik. All the bold ones have to be interred, and are probably (based on the canon) regions regukarly overrunn(according to ruins) by either Trolls or Ethengerians. I question though how large these areas would be The Dukedom of Estine was the Largest in title, so I imagine the others would be significantly smaller (baron 8miles? ), Countship (16? ), viscount (somehere in between?. )..and suggestions are welcome. I created several more villages in the Vestland region (which I based on https://en.wikipedia.org/wiki/Lists_of_ ... _in_Norway. This link maybe important to you as it is an easy way to determine Heraldic shields of these settlements (just take the real ones). Summarized descriptions of these settlements will follow later too. In the Trollheim hills, the terrain rolls with steep slopes and rocky outcrops dropping into narrow, wooded valleys. soft wet turf and low bogs make travel in the area difficult. human travellers are forced to keep to the barren high ground where they are easily spottted from troll outposts. The Trollheim hills are swept year-round by high winds, creating tree-less high moors and dese woods in the sheltered hollows. In the Trollheim hills, the high moors are covered with low, hardy heather, while ash and yew dominate the groves of the sheltered dales. the new duke would send in an armed expedition to drive away the resident trolls an as soon as possible, build a fort that doubled as the ducal residence. unfortunately, the dukes generally failed to occupy or garrison the forts, and few were persistent or effective in keeping the trolls out of their dominions. settlers who moved into these regions, clearing land for their sheep farms and building fortified steads, often found themselves unprotected from troll raids. The grey elliptical shape is the average region 90% of the time covered by a fogbank, created by the warm moisture from the 17 geysers (Sjutton Fontäner Ragnarok), the Elemental Watergate, where the Trolls life. due the moisture and temperature deciduous trees are dominant in this region and somewhat beyond, where else ever green would grow. The geothermal uplifting has created a variant and wet area called Trollheim.